What Happens to Dumpster Rentals Once They are Filled? Big projects like home remodeling or property cleanouts can create tons of trash, so it’s critical that you find a simple solution for debris removal. Junk King offers both full-service junk removal and dumpster rentals if you need self-service junk removal. Our MINI dumpster is driveway-friendly, easy to use, and affordable. Junk King gives you the options you want, including flexible scheduling as well as eco-friendly recycling and disposal. Wondering what to expect from one of our dumpster rentals? We drop off the container; you fill it with junk at your own pace over the course of 3 or more days; then we arrive at your chosen appointment time to pick it up and take care of the rest. Let us know when to haul away the MINI, and we’ll be there! Junk King has flexible scheduling for 3 or more days of rental. We do everything we can to show up at the exact time you have pre-selected for pick-up. To be sure, our team will give you a phone call about 15 minutes before we arrive to confirm that you are home and ready to have the loaded dumpster taken away. Why pay for space you don’t use? Toss your household junk into the MINI dumpster and pay based on the volume! We have a minimum price, a 1/2 full price, and a full dumpster price. 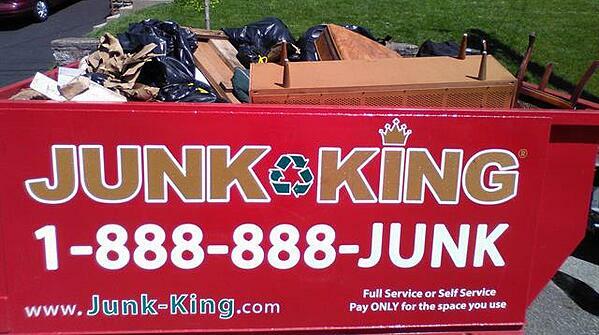 Junk King was the first in the industry to offer pay-per-use dumpster rental pricing. Our competitors charge a standard price even if you don’t use half the space. If you need a solution for a smaller cleaning project, you can pay less and get the service you need with Junk King. Our truck can’t drive away with junk sticking out of the top of the container. Dumpster rentals require you to pack everything completely into them. If there are bulky or long items sticking out, please try to break them down before we arrive! You’ve been busy. Now comes the best part — Junk King takes care of hauling away the dumpster so you can use your newly clutter-free space. Our team makes sure everything has been finished up with the process, and then we load the container back onto the truck and say goodbye. Sending your stuff away with Junk King means you can feel good about using green methods of waste disposal. Junk King sorts the junk we take into various recyclable materials like metal, wood, and plastic, as well as items that can be broken down and recycled like televisions, hot tubs, and mattresses. The beauty of our country and our environmental health are important to us at Junk King. We take recycling and green disposal very seriously. The items in our dumpster rentals will not go to landfill if we can find any other option! Using a rented dumpster can be easy and convenient with great customer service from Junk King. With our affordable rates and pay per use pricing, you can get the job done for a low price, too. Call 1-888-888-JUNK (5865) or book online and save $30 on your next rental from Junk King, the eco-friendly leaders in professional junk removal.